Graduation Cap & Gown for children from Grad Goods & More, since 1979. Made in USA. Choose Grad Goods & More for Graduation cap & gown for kids made in the USA. 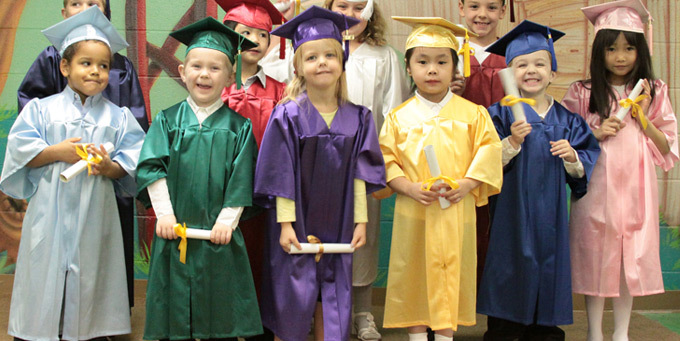 Preschool and kindergarten graduations are memorable with our delightful caps & gowns. Or- use as gown alone- our white Kindergrad robes are a great choice for angel choirs! Order as gown-only, cap and tassel or the complete "Kindergrad Package" outfit of cap, year-dated tassel, diploma & gown. Contact us today for pricing and order information. Preschool graduation robes, cap & gown for kindergarten graduation, children's graduation cap & gown, preschool graduation caps & gowns, kids' souvenir robes made in USA. Graduation cap & gown for kids. Buy kindergrad cap, gown & tassel package. Cheap kids' choir robes. Oak Hall kindergrad robes.